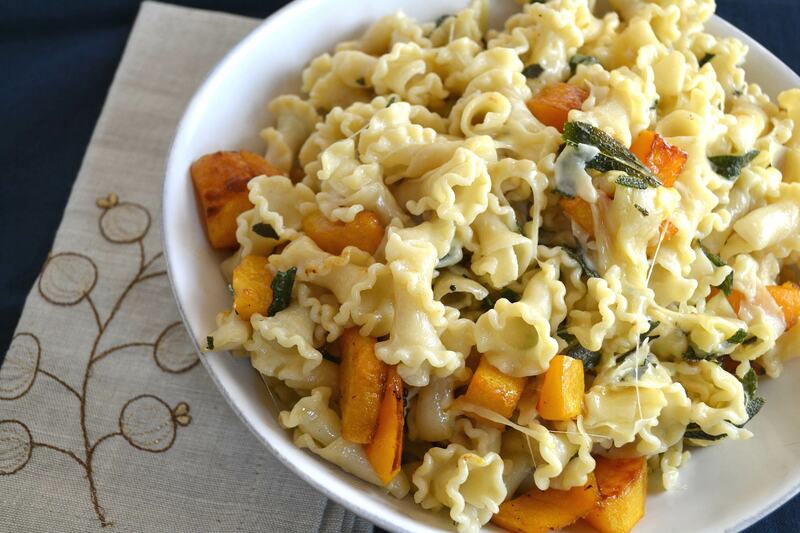 Roasted butternut squash and sage sauteed in melted butter get drizzled over pasta and topped with Parmesan cheese in this comforting dish. Preheat the oven to 450 degrees Fahrenheit. Place the cubed squash onto a baking sheet and drizzle with olive oil. Season with salt and pepper. Roast for 20-30 minutes, until the squash is golden brown. Meanwhile, bring a pot of water to boil on the stove. Cook the pasta until tender, about 9 minutes. Drain and place into a large bowl. Melt the butter in a saute pan over low heat. Place the minced sage into the pan and cook until it begins to crisp, about 5 minutes. Pour the butter and sage over the cooked pasta, along with the Parmesan cheese, and stir until the cheese is melted. Add the squash and gently stir to combine. Season with salt and pepper. Serve immediately.